While the McCain/Palin camp falls over itself trying to parse language to say that Troopergate investigator Stephen Branchflower was wrong to say that Sarah Palin violated the Alaska Ethics Act, Time magazine reports that however one interprets the report issued Friday, it is clear Palin and her husband showed a "disturbing" lack of judgment and a great deal of self-serving immaturity. Did Governor Sarah Palin abuse the power of her office in trying to get her former brother-in-law, State Trooper Mike Wooten, fired? Yes. Was the refusal to fire Mike Wooten the reason Palin fired Commissioner of Public Safety Walt Monegan? Not exclusively, and it was within her rights as the states chief executive to fire him for just about any reason, even without cause. ... But the Branchflower report still makes for good reading, if only because it convincingly answers a question nobody had even thought to ask: Is the Palin administration shockingly amateurish? Yes, it is. Disturbingly so. The 263 pages of the report show a co-ordinated application of pressure on Monegan so transparent and ham-handed that it was almost certain to end in public embarrassment for the governor. ... A harsh verdict? Consider the report's findings. Not only did people at almost every level of the Palin administration engage in repeated inappropriate contact with Walt Monegan and other high-ranking officials at the Department of Public Safety, but Monegan and his peers constantly warned these Palin disciples that the contact was inappropriate and probably unlawful. Still, the emails and calls continued — in at least one instance on recorded state trooper phone lines. Sec. 39.52.010. Declaration of policy. performance of their public responsibilities [emphasis mine]. All one needs to do is to read the law itself. Again, it says "personal or financial interests." Palin does not have a leg upon which to stand here. She broke the law. The governor will not go to jail over this and may escape sanction, but the truth is plain, as is her obvious personal stake in the misconduct of herself, her spouse, and her underlings. Brian Ross of ABC News reports that investigator Stephen Branchflower determined that while Sarah and Todd Palin's desire to have their former brother-in-law fired was not the only reason for Walt Monegan's sacking, it was part of the justification for it, and that made the move unethical and illegal. 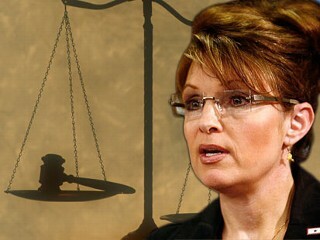 The Attorney General’s office has failed to substantially comply with my August 6, 2008, written request to Governor Sarah Palin for information about the case in the form of emails. "Governor Palin knowingly permitted a situation to continue where impermissible pressure was placed on several subordinates in order to advance a personal agenda, to wit: To get Trooper Michael Wooten fired,'' according to the report issued today in Anchorage. Even so, the report said Palin's firing in July of former state Public Safety Commissioner Walt Monegan, who had refused to fire Wooten, was a "proper and lawful exercise'' of her wide authority to fire department heads for any reason. Monegan contends the governor dismissed him for refusing to fire Wooten, who was involved in a divorce and custody battle with Palin's sister. Violation of the ethics act could result in sanctions, such as a fine, by a state ethics board, lawmakers said. Members of the Legislative Council voted 12-0 to release the report even though there wasn't agreement on the findings, lawmakers said. "I don't think there is a consensus on the conclusions,'' said Representative Bill Stoltze.